It has been suggested that this page or section be merged with Buzz Bomber. Beeton, (ビートン) is a badnik found in Sonic Chaos. There are three versions; a black flying badnik found in Turquoise Hill Zone, a similar grey flying badnik found in Gigapolis Zone and a stationary grey badnik found in Electric Egg Zone. 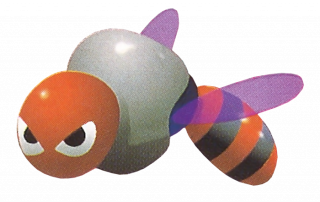 They are similar to Buzz Bombers found in Sonic 1 and Buzzers found in Sonic 2, but have no projectiles. This page was last edited on 7 August 2018, at 18:30.